AOL customers + speed problems - Page 7 - The Scream! Being an AOL Broadband customer I too suffer with the download speed issue. I am not particulary interested in the technical vagueries contributing to this. Why is broadband treated differently to other products, if we pay for something we expect it to work. 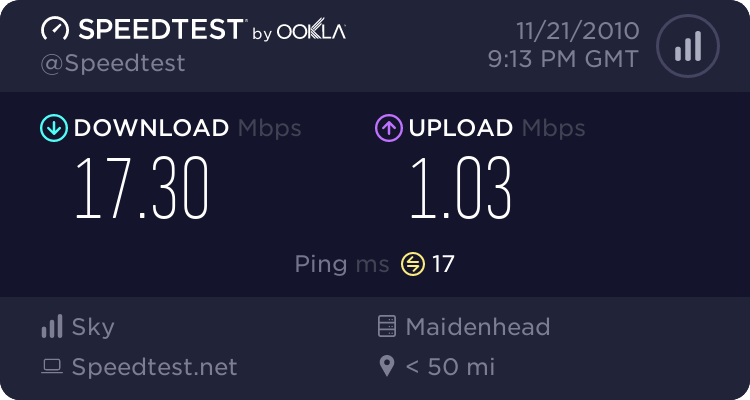 It is clear that AOL make no attempt to address the speed issue or if they do they don't communicate this to their Customers. At last a MAC number was generated and sent to my e-mail address. Her parting shot was the offer of £27.00 credit, 8 meg unlimited, free local and national calls 24/7, and all for £15.99 per month no contract with the talk. Very attractive but they could'nt or would'nt do the 2 meg so what chance this would be better ? I have this offer on e-mail. I have since carried out a couple of other checks. If I want to get up at 3.00 in the morning I can have 2 meg access. My BT exchange has max 6.5 meg and is not over untilised. Urgh, today my DNS is completely screwed. This is the only website I can get on. AOL are pathetic. I'm ringing AoHell tomorrow and getting my Mac code and cancelling my direct debit. Couldn't get online all night last night and into today and my wife was unable to complete the risk assessments for her school trip due to the program requiring a web connection. Since signing up to the new package I have lost internet connection now about 15 times and for 3 weeks in the end of October I could not achieve a speed above 20kbps!!! My iPhone uses 3g on o2, I downloaded broadband speed checker for it and 3g download is 1997kbps or 2 meg!!! Going to sign up with either BT broadband or o2 broadband me thinks!! im fed up playing games with other people around the world and then lose connection...whats up with you lot..(aol)...do you want every one to leave before you do anything about it..
Why are you paying so much? I am getting AOL Talk Unlimited and 8 Mb for £12.99. I just got it reduced from £15.99 and received a new router for staying for another 12 months! I have been with AOL for 12 years, they DO seem keen to keep you if call. anybody that is not with aol i just have one thing to say :for the love of god dont sign up , i recently was offered 8 meg broadband for even less than i was paying for a 512kbs broadband service and instead of improving upon my download speeds they have infact droped substantialy , aol i ripping people off by offering a download speed in a legal contract then not liveing up to its expectations witch i belive should be against the law . Why do you think that your speed should be 8Mbs? I ssume that this is an " up to" 8M connection. The actual speed would depend on your line quality, distance from the exchange etc. Wirelessly, This is your problem. Nothing to do with your ISP. Connection stability depends on local interference in your house, your channel selection, your neighbours wireless connection etc. Not sure about the tomtom connection. It may be a fragmentation issue. Try changing your mtu to 1400. Look on your router under WAN/Internet or DSL setup pages. I have had ongoing inference with my AOL connection, but as the previous posted stated, this may not have anything to do with AOL specifically. I've been with AOL for about 6 years geneally found them adequate. I've used their help line a lot as I'm in a bad reception area but trying to get the best speed I can. Their Indian tech guys are polite and helpful but I find they are not always easy to understand - partly my hearing perhaps. Up until last month I'd finally got it sussed. (netgear router, new filters, hard wired ethernet cables from master phone socket etc). 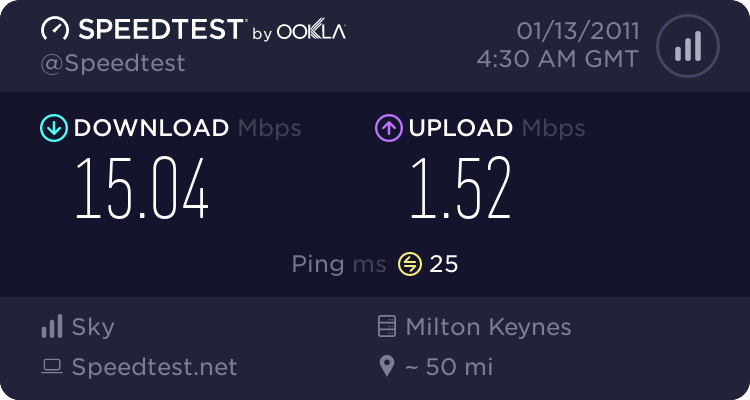 However last few weeks my connection, which can still get up to 3.7 very early in the mornings, has dropped like a stone and is very spikey. Now get 0.4 - 0.8 at most during late afternoon or evening. My wife plays WoW and gets frequently disconnected or very slow updates. Rang AOL but apart from changing a line in my router data thay were no help. Neighbours report no real change or grief on their connection - they aren't on AOL. Is it an AOL problem or could BT be effecting non BT lines to get people to change? A speedchecker reported a BT user test in my area this month of 6.3 at peak time so it can be done. I get my phone line from Pipex so I'm passed from pillar to post by the 3 companies involved. 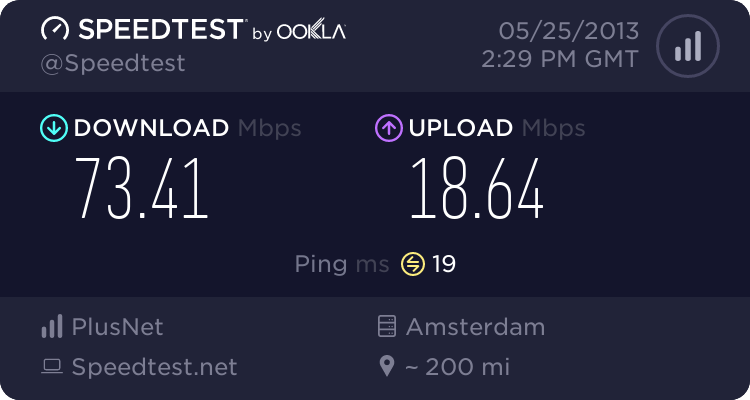 Ive been with aol since dial up and my speeds have been pretty good, but these last few weeks ive gone from 6-7 meg to 0.5 meg. Ive found this site since googling around to see if anybody else was having problems. Im on 8 meg and my line can handle 10, i dunno whether just to jack aol in. Aol are an absolute nightmare. I pay for "up to" 8mb, and off peak i get around 4.5mb which is fine. At peak times im getting no more than 80-120kbps. I have rang them more times than i care to remember, i have gone through the "test your line with speedtester.bt.com" shenanigans two or three times. Each time after i finally get through to LVL 2 tech support, they close the fault and i have to start again. I really dont know what to do, my local exchange isnt brilliant and i have no idea if changing to a different isp will improve things. The only thing i know is that the call centres in India have NO CLUE what they are talking about, they wouldnt know a 'contention ratio' if it smacked them in the face. I am so fed up, its 2010 for gods sake . . .where is this internet revolution!! Any advice, because AOL certainly have none. The Downstream connection speed is always around that speed. I have had a BT engineer out to my house, who changed the phone sockets and installed a specific ADSL only port which meant i could remove the filters. It has made no difference at all. Aol seem to be particularly bad recently, i dream of the day when i can actually watch a Youtube video. Am seriously thinking of leaving them, anyone else got these problems? I have recently noticed very erratic speeds using AOL 9.1. I now use internet explorer with google as my home page. For some reason the speed is much faster and less erratic. I suggest others giving it a go. I mentioned this to AOL a few years ago but they could not explain it. Thought it would have been sorted with 9.1 but NO. just thought I would let you guys know. I changed from AOL to BT. I am now getting 4.3 meg at all times, regardless of peak or not. It seems AOL were not renting enough bandwidth to provide my area. Very happy with BT. I have almost had the identical problem as you. They have sent me around the swings and roundabouts and have wound up exactly where I started. I have been getting less than 0.5 meg at peak times. It does fluctuate wildly about 7am in the morning it starts at nearly 7meg but by 17.30hrs it has disappeared to 0.5meg. This is very frustrating. I have now fitted a BT I plate accelerator to my BT phone socket which I have been told that you can get remarkable improvements but I have not seen any as yet. It has only been a week and have been told to give it up to a fortnight. The only real alternative is to change providers. As BT customer such as my neighbour across the road who is getting 5.7 meg at peak times. Can anyone explain as I am confused as to way my AOL broadband speed shows over 6 meg in the morning at 7am but when 18.00hrs comes round it falls to under 0.5meg. This is very frustrating and Aol cannot come up with any solutions to resolve the problem. I have attached a BT I plate accelerate about a week ago which does not to have improved things even though i have been told it does take longer than this to work? I live only 312 metres from the exchange and in a 8 meg area!!!!!! BT customers in the area seem to get a much better and consistent service, is it just a case of changing ISP. Thanks for that Tommy t you have more or less answered what I probably already knew. I think I will try new ISP's as it cant be any worse. I am tied in with Aol for the next 3 months as they have given me three months free and see if things improve but I am not going to hold my breath. I will try different ISP's if I can get short term contracts with them if that is possible until hopefully I find one that gives me the broadband speed I am paying for. I gave Aol 2 years to make things better, I had exactly the same problem as you. 5mb in the morning and less than 0.07mb at peak times. I tried everything, and I was convinced that it was just my local exchange and changing would make no difference. How wrong I was, with BT my connection never dips below 4 meg, and for the first time in my life I can actually use IPlayer lol. Seroiusly, it IS Aol. Don't give them any more chances, and If you are in a rural area don't bother with any isp's which rent space from BT. In cities you have more choice, the exchanges are generally closer and have larger capacity. For me inthe middle of nowhere BT are the only option. Have you tried the BT I plate accelerator. I fitted this to my main socket which is really easy to do over month ago. I was getting less that 0.5 meg at peak times now getting over 5meg on regular bases. Dont expect instant results although some people do, it took about three weeks before I saw any significant change. They are cost about £5 with Amazon to get well worth it even if it does not work for you. Never got a new filter and within an hour of that phone call, well what do you know, my speed went up to 6 mb +, and that’s with the old filter, its AOL just trying to get you to upgrade. Well I have never had such poor speed it's worse than in the days of dial up. 0.70kbps and I can look out my window at the exchange.